Kathleen Benson is the author of several picture books, many of which she co-authored with her late husband, Jim Haskins, including John Lewis in the Lead, which won the NCSS Carter G. Woodson Award for the most distinguished social science book for young readers that depicts ethnicity in the United States. Kathy is currently a Project Director at the Museum of the City of New York. She lives in Manhattan. Many people may not be familiar with the art of Benny Andrews before reading Benson's book; I was one of those. How I feel like I've lost so much time not knowing his artwork, yet I feel fortunate now to have been exposed to it. Benny Andrews was born in Plainview, Georgia in 1930, and while some of his greatest artwork came from the time he learned to draw at three years old to his early adulthood, he is perhaps most recently recognized from his time spent in New Orleans after Hurricane Katrina. For many children, Katrina meant leaving home and learning in a new school, but Andrews taught them how to express what they saw and felt, how to take the tragedy that Katrina brought and turn it into something beautiful. Kathleen Benson takes us back to where it all began in 30s Georgia where Benson first learned to draw what he saw around him, which consisted of African Americans working in the fields. While many associate field work with slavery, Andrews portrayed the labor of those who worked for a living, for money, not because someone was looming over them with whips. Andrews illustrated everything from Sundays in church seeing the "beautiful hats" to writing a letter to Dr. Martin Luther King Jr. His illustrations are colorful and realistic, expressing hope, determination, and joy in the midst of the Civil Rights Era. Benson provides a biography of Andrews, pairing her text with illustrations that represent each period in Andrews's life. She includes a "More About Benny Andrews" section along with her Sources and Resources and Timeline: The Life of Benny Andrews. 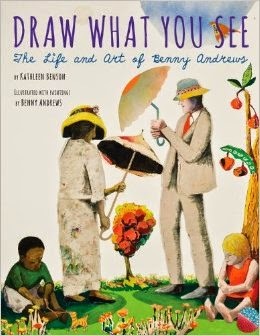 Through Andrews's illustrations, Benson gives young people a succinct look into the life of a man who saw the world through reds, greens, and blues, not painting over the truth of the times but ensuring that the world would always be able to see the truth through his eyes.